Born in Trinidad-Tobago, and a long time resident of Halifax, Nova Scotia, Saney is a Senior Instructor in the Transitional Year Program of the faculty of the College of Continuing Education, Dalhousie University, and is an Adjunct Professor of History at Saint Mary’s University. He is also a member of the Nova Scotia – Cuba Association, and is the National Spokesperson for the Canadian Network on Cuba. In addition to his teaching and activism, Saney has written numerous articles and papers, and co-produced the film, My Sisters' and Brothers' Keeper, with Mark Rushton. The film addresses Cuba's engagement in Africa in support of the South African struggle against apartheid. He recently completed a dissertation for the School of Oriental and African Studies at the University of London, England, “From Soweto to Cuito Cuanavale: Cuba, the War in Angola, and the End of Apartheid”. Dr. Cooper calls his acclaimed book, Cuba: A Revolution In Motion (Fernwood), “a mandatory read... in the Caribbean Studies world”. Saney's talk Wednesday evening focused on focused on race, class, and Black identity in Cuba, and sought to address “...Why the Cuban Revolution has exercised such a profound hold and influence on the world-wide Black struggle equality, freedom, and self-determination and whether the Cuban Revolution has any meaning and relevance for present day struggles and imaginings of a world centred on social justice, human dignity, and general emancipation”. While it is understood that race is a social construct embedded in the history of empire and capitalism, it does have a concrete impact in the world and informs perceptions of value, meaning and identity in relation to geography, culture and history. Beginning with Cuba's influence on Black radicals in the 60's and it's continuing influence on Black progressive circles, he recounted the September 1960 visit of Fidel Castro to Harlem and his historical meeting with Malcom X and referred to the experience and writings of well known figures such as Robbin Kelley (Freedom Dreams: A Black Radical Imagination), Robert Williams (Negroes with Guns, The Crusader, and Radio Free Dixie), Amira Baraka aka Leroi Jones (Free Cuba Libre) and Harold Cruise. Journalists Julian Mayfield and William Worthy were cited, as was Kwame Ture aka Stokely Carmichael (Ready for Revolution) whom Saney met with just a month before his death on November 15, 1998. Saney gave a quick overview of Cuban history before 1959, especially as related to Black Cubans. Beginning with Hatuey, a leader of the Indigenous Taino resistance to the Spanish invasion, and the Haitian Revolution's human and economic impact on Cuba, Saney related the joining of the Creole independence struggle with the Black and Indigenous struggle for freedom and dignity. Another important moment in Cuban history was "The Cry of Yara", the name given to October 10, 1868, when Carlos Manuel Cespedes freed his slaves, who then joined him in his revolt against Spain for an independent Cuba, and the continuing resistance throughout the period leading up to the 10 year war. Saney places the ideas of Jose Marti at the center of the Cuban Revolution, race relations in Cuba and at the beginnings of the Latin American struggle against imperialist expansion and intervention by the United States. 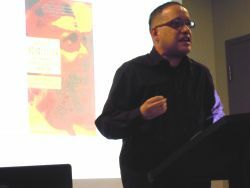 Marti's analysis of the role that disunity played in the failure of the 10 year war and his understanding of the need for social transformation in revolution, together with his advocacy of equality and anti-racist statements are crucial to an understanding of the Cuban experience in dealing with state and individual racism. Saney described the reversal of gains and continued resistance following the U.S. intervention after the 3 Year War, and the impact on Black Cubans of the first years of the Revolution, part of the historical context needed for a critical understanding of developments following 1989: the “Special Period” after the dissolution of the Soviet Bloc and the resulting creation of economic policies that would have great impact on Cuban society. The Cuban experience of the interrelation of class, economic issues with the politics of race and identity demonstrates that issues of race and identity can not be subordinated to class in contemporary struggles for liberation, equality and anti-capitalist development. Listen to or download a recording of Isaac Saney's entire JRJ Chair lecture. (linked above). The James Robinson Johnston Lecture Series continues next month with “White Man's Burden: The New Scramble for Africa”, a lecture by Dr. Hakim Adi on Wednesday, March 21st, 2012 at Room 303, Dalhousie Student Union Building, 6136 University Avenue, Halifax.